One of the favorite puzzle types here at Puzzazz is cryptic crosswords, in which every clue is a small puzzle by itself. A cryptic crossword in a puzzlehunt is a bunch of small puzzles that make up a bigger puzzle that's part of an even bigger puzzle. We're very happy that Mike Selinker, one of the masters of creating cryptic crosswords, will be creating a puzzle for the Year of Puzzles. Mike's the President of Lone Shark Games and the author of Mike Selinker's Killer Cryptics, one of the cryptic crossword ebooks available in our puzzle store. Mike's created a cryptic sampler which nicely describes what all our backers are to us. 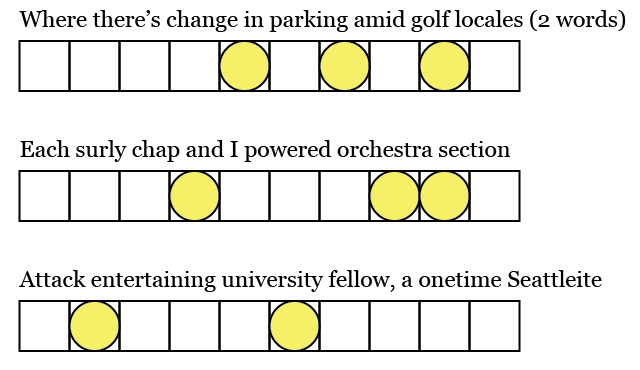 Each clue below leads to a 10-letter entry which is an anagram of the other two entries. Place each answer in the boxes, then read the circled letters from top to bottom to get the answer. If you're new to cryptic crosswords, we highly recommend our How to Solve Cryptic Crosswords guide, co-written by Mike and our founder Roy Leban. We've added two pledge levels that might be of interest for you. The ENCRYPTOR LEVEL, a step up from the GRANDMASTER LEVEL, gets you an original piece of artwork from the set of art being created for the T-Shirt puzzles. The art will be hand drawn on paper by a professional artist, probably in pen, pencil, pastel, or a combination. The art may be early sketches or close-to-final art, but we'll do our best to make sure it's interesting. The CRUCIVERBALIST LEVEL, a step down from the ENIGMATOLOGIST LEVEL, lets you sponsor a puzzle on a specific day during the year. If you pledge at this level, everybody at the NINJA LEVEL and above gets one more puzzle, so they'll all be happy. And, because you get credit, they'll all be happy with you. See the pledge level and FAQ for details. Did you notice that we've used a bunch of prime numbers in the campaign? It's not a puzzle. We just like prime numbers. One of our favorite tools for exploring words is Zyzzyva. It's intended for Scrabble players, but it's useful for anyone who does anagramming or similar wordplay. And it's free (if you have an iPhone, Zyzzyva Lite is free). In the Protiles puzzle, the answer word is worth 17 points (not counting the bingo bonus). To figure out a palindrome, start with any proper names. One-letter words and words with apostrophes only have a few possibilities, so they can be a big help. The clue phrases map pretty directly, so look for synonyms of the right length. If you're still searching for one of the hidden puzzles, things have changed. You might want to look at the summary information at the bottom of the main page again. @Joshua: There will definitely be one cryptic in the Year of Puzzles, but we only had 1 cryptic out of 17 puzzles here and we're not going to deviate too far from that ratio. Now that we've reached 18 puzzles, we might have a second one. When you solve in the Puzzazz app, you'll have full hinting available, which can make a huge difference if you're new to cryptic crosswords. Outside the Puzzazz app, we'll provide some hints as well, but we don't know the details yet. Personally, the first few times I saw a cryptic crossword, I was dazed and confused. But, once I learned how to do them, they became one of my favorite puzzle types. Ugh. I hope these aren't very prevalent in the year of puzzles. Struggled a lot with this one and even using all 3 hints we had to work to understand what the solution was.